"Nutty". "Overlaid with Fruit tones" "Sweet background" are desciptors applied to both beer and good fruitcake. Why not bring those together to make a special pairing? Add a little cheddar cheese and you've got a drink and appetizer ready in less than a minute. Salty and sweety and smokey anyone? 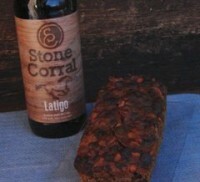 We are into Stone Corral's Latigo, Scotch Ale. http://stonecorral.com/Our_Brews.html What is your pick? We will be forced to test your suggestion and get back to you, so thanks!